and I do okay with Instagram, so please come find me at both those places! Meanwhile, welcome to the new website (courtesy of Shannon Hale). I can assure you, you’ll find no blogging here, although as the site takes shape, you’ll likely get updates on convention schedule, upcoming books, and all manner of stuff. And if you don’t know anything about me, please check out the About the Author page for some quick background. 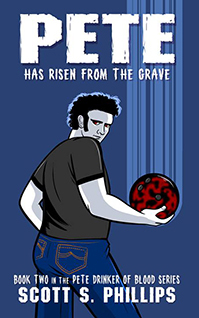 My most recent book is Pete Has Risen from the Grave, Book Two in the Pete, Drinker of Blood series. I’ve recently starting writing the next book in the series, Taste the Blood of Pete. So nose around and check stuff out! Thanks for visiting, and I hope you dig the books and whatnot!